Here’s another recipe to add to the braising obsession. This one comes straight from my mom. She makes this dish all of the time, and it’s one of my favorite mom dishes. The technique is fairly straight forward Mexican cuisine, but the flavors always seemed very Spanish to me. In a large cast iron dutch oven, heat 1 teaspoon of olive oil and sear the chicken pieces until all sides have a brown, crisp sear. While chicken is searing, cut the tomatoes and onion into large chunks, place in blender along with the garlic, and blend until it forms a thick sauce. Once Chicken is done searing add the sauce and the remaining ingredients. Bring to a boil, cover the pot and lower the temperature. Simmer for two hours or until the chicken becomes tender. Add salt and pepper to taste. Enjoy! I make this all the time, always during the week because it is so quick and easy. It is so delicious and comforting. 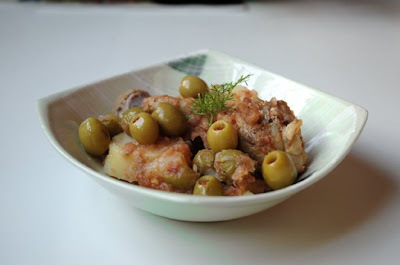 The capers and olives add just the right depth of flavor and salt. It makes the house smell wonderful, and is especially welcome on a cold night. Even though it has potatoes, my boys (5 and 7) like it over white rice. And it feeds four for under ten dollars! Bonus! « Get Our Posts Automatically!